We were lucky to see lions on a kill. But are lions disappearing from Africa? A lion we spotted on a kill in South Africa. Note the blood on his lower jaw. If you go on a "game drive" in Africa, looking for wildlife with cameras & binoculars, the guide always starts off by asking, "What do you all want to see?". The answer from everyone in the jeep is always the same...."lions, leopards, cheetahs". People are fascinated with the big cats. 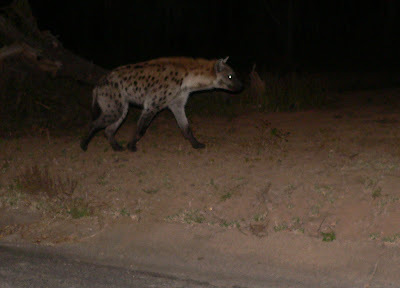 Even though hyenas are the second most powerful carnivore on the continent, I never once heard anyone asking for hyenas. It was always the cats. Unfortunately, cats are among the hardest of the big animals to find, even in reserves and parks like South Africa's Kruger National Park. We were lucky this past June to come across a couple of adult male lions on the carcass of a big Cape Buffalo, just outside of Kruger in a protected area that's part of "Greater Kruger." The carcass was only 10 feet from the sandy road we were driving down. We couldn't get a clear shot of the carcass because of the bushes and grasses in the way. But we waited and we did get clear shots of the lions when they got up to stretch and sleep. 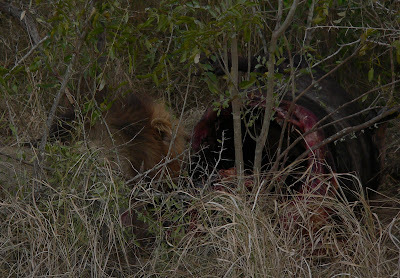 One of the lions (left) pulling meat from what's left of the Cape Buffalo carcass. You can see the open body cavity on the right, and the buffalo's gray skin still covering the rib cage. Presently one of the lions got up to relieve himself in the grass (below). Then the second lion got up, and ambled over to the soft sandy road to sleep. He was so stuffed and so sleepy that he almost stumbled as though he were drunk. Note the blood on his front legs and face (two photos below). We came across the same lions at the same spot the next day (below). Again, one of them was napping in the road, too full and sleepy to even get up to urinate. 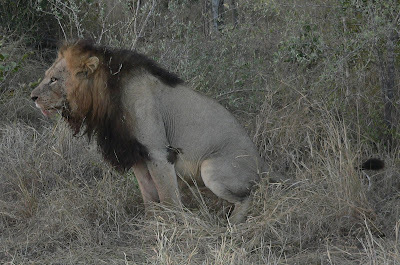 Instead he urinated where he lay (as we watched) and the urine pooled around his rear end. Although we were lucky to see these lions that stayed on the kill for several days, we didn't see many other lions, even though we looked for about a month inside Kruger Park and in reserves abutting Kruger. I had expected cheetahs and leopards to be rare, but I was surprised at the scarcity of lions. I shouldn't have been surprised. Africa's lion population is sharply declining, I'm now learning. The number of free-roaming African lions has dropped from 50,000 just 10 years ago to somewhere between 10,000 and 23,000 today. That's a decline of more than 50% in just a decade! And, according to Jeff Corwin, there were 250,000 lions in Africa only 25 years ago! Some scientists, such as Dr. Laurence Frank of UC Berkeley, believe the African lion is on the road to extinction. It's mostly about conflict with humans. As human populations in sub-Saharan Africa expand, the land left for prey populations decreases. A single pride of lions requires a hunting territory of 8 - 154 sq miles (20-400 sq km), depending on the density of prey animals. Lions generally eat the commonest hoofed animals nearby - impala, wildebeest, zebra - all grazers that need a lot of grazing space. Loss of habitat due to human population growth and human activities is the primary cause of the decrease in lion numbers in Africa. Jeff Corwin says that lions have lost 80% of their habitat in the last century. African lions are now officially listed as Endangered (West African subspecies) and Vulnerable (East and Southern African subspecies) by the World Conservation Union and are on Appendix II of the CITES (Convention on International Trade in Endangered Species) list. But loss of habitat is not the only cause; other factors play a role in their decline. As the human population increases, so does the number of livestock. In Kenya and Tanzania, the Maasai people graze their cattle on the same lands where lions roam, or have roamed. Cattle are equivalent to wealth and status for the Maasai. When prey is not plentiful, some lions will kill livestock. 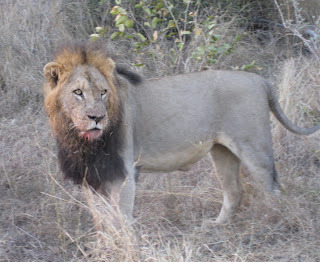 Traditionally Maasai have eliminated such lions by hunting them with spears. Nowadays though, the lions can be eliminated much more easily by poisoning carcasses with a cheap and common crop pesticide, Furadan, and then leaving the poisoned carcasses out for lions to take. (Lions are scavengers as well as predators.) In March of 2009, the TV news program "60 Minutes" ran a story on the American chemical Furadan: "Poison Takes Toll on Africa's Lions." With hidden cameras, reporters documented that Furadan was commonly available in Kenyan shops that were miles from any cropland, where shopkeepers chuckled when asked what the Furadan was for. After the story aired on national TV in the U.S., the American manufacturer promised to stop all sales of Furadan in Kenya, Uganda, and Tanzania. In a July 25 update online, the 60 Minutes staff report that Furadan has been pulled from the shelves in Kenya, but not in neighboring Tanzania or Uganda. Disease is also a serious problem for lions. We were told by several wildlife guides and scientists in Kruger that lions in South Africa are suffering from tuberculosis contracted from cattle. We were told that TB doesn't kill them immediately, but weakens them and shortens their life span. In addition, according to The Lion Foundation, 90% of free-roaming lions in Botswana are infected with FIV, the feline equivalent of HIV. And the lions of the Serengeti decreased around 30% after a 1997 outbreak of canine distemper. 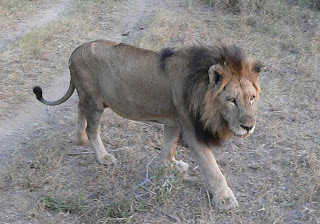 A thin, weak lion we saw in 2007. We watched him try to climb a tree, but he was unable to. At the time I thought he was old. But now I wonder, did he have TB? 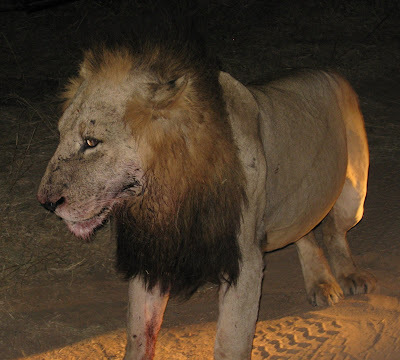 Trophy hunting or so-called "canned hunting" also takes its toll on African lion populations. Private ranches are often stocked with game animals just to provide easy shooting for those who like to kill big animals. By some reports, as many as 1500 lions are shot annually in southern Africa for trophies. Most desired are black-maned male lions in their prime reproductive years. But according to The Lion Foundation, approximately 6-8 other lions die each time such a male is shot. That's because another male will take his place in the pride, and when that happens, the newcomer generally kills all the cubs in the pride, which makes the females come into estrus sooner than they would otherwise. Occasionally adult females are even killed trying to protect their cubs. It's an adaptive strategy for a newly dominant male to kill the cubs of his predecessor, because it increases the likelihood of propagating his own genes, which is what natural selection is all about. But it wreaks havoc in a system when prime males are plucked out over and over by trophy hunters. What's the problem?? How'd we get here? Families whose survival is dependent on their livestock will and must protect their domestic animals from predators. Poverty leads to rapid population growth and overgrazing, both of which contribute to habitat loss for prey and predators. When local families are impoverished, the breadwinners are of course tempted to make money selling lions to shooting ranches, where Europeans, Americans, and Asians pay thousands to shoot big lions (and other big animals). Practical short-term solutions include reimbursing herders or livestock owners for animals that are lost to predation, which is now happening in some places. Other solutions include recruiting Maasai and others in agrarian or herding communities into clubs or groups such as the Lion Guardians of Kenya, who stand guard and alert their neighbors when predators are nearby. Ultimately the broader solution is support and assistance for the families and communities of Africa. That means sustainable employment that gives local people an incentive to preserve their natural resources, including lions. We need to empower women with education and jobs; when women are empowered, they choose to have smaller families, which leads to higher incomes and more opportunities for their children. People with choices and opportunities don't have to poison lions or sell lions to shooting ranches. 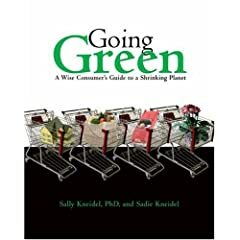 One thing we can do is to support organizations that are working on solutions - organizations such as the Nature Conservancy, Conservation International, the World Wildlife Fund. If you know others, write a comment after this post and tell me. Another thing we can do is this: when we travel, we can make sure that our travel dollars go to local people, not international chains that will funnel the money to stockholders in other countries. It's not that hard to do. Americans spend 12 billion dollars a year in Africa. Let's put it in the hands of the local people. Poison Takes Toll on Africa's Lions: Kenyan Cattle Herders Are Using the American Pesticide Furadan to Kill the Predators. 60 Minutes. CBS News. July 25, 2009. Investigation Earth with Jeff Corwin. Planet Green TV network. July 27, 2009. Nicholas Bakalar. 2005. Lions in South Africa Pressured by TB Outbreak, Hunters. National Geographic News. Richard D. Estes. Safari Companion: A Guide to Watching African Mammals. Chelsea Green Publishing Co. I told a friend yesterday, the only time my brain gives me any peace is when I'm either workingon my blog, or I'm in a foreign place that's totally strange (and intriguing) to me. I like a place best when I have no idea what to expect and a lot to learn. 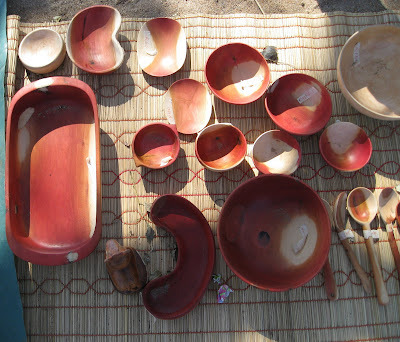 That's one reason I yearned to go to the Venda village of Hamakuya, South Africa - a completely new place for me. It's in the Makuya region just west of northern Kruger National Park. 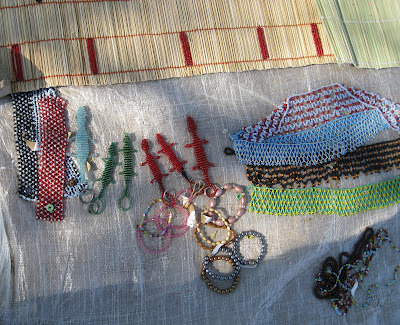 Dr. Laurence Kruger, director of South Africa's Organization for Tropical Studies, had recommended Hamakuya - he sometimes takes students from his OTS ecology course to the village. 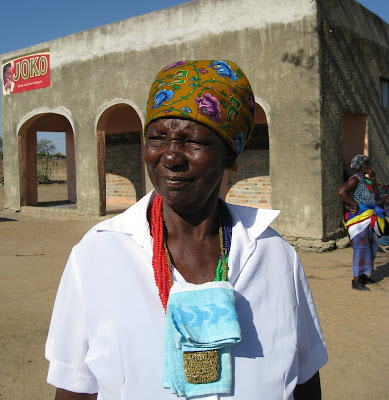 We'd already had a fantastic experience, twice, in the Shangaan village of Welverdiend, South Africa. I knew Hamakuya would be different. It's a different indigenous culture, with a different language. 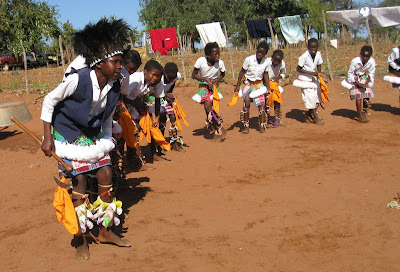 The Venda culture and language of Hamakuya are originally from Zambia, unlike South Africa's many other indigenous cultures and languages. Ken and I weren't sure how to get to Hamakuya from Kruger Park; both options involved difficult roads unless you have a 4WD, preferably a truck. 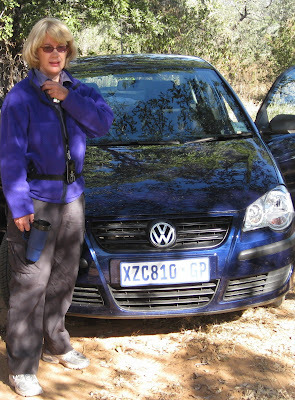 We were driving a small rental car, a VW Polo. But what the heck, we like a challenge. We decided to leave the Park via the northernmost gate, the Pafuri Gate, just a couple of miles south of Zambia and Mozambique. As soon as we left the Park, the pavement deteriorated. Women selling one or two fruits of baobab trees stood at intervals alongside the road. Presently the pavement gave way to a "natural" road of dirt and jolting rocks. We had to drive very slowly. Still, it only took about 2 hours from the Pafuri Gate to the little road that leads into the village of Hamakuya. We were in for a treat. Hamakuya is a very small village, more like a small collection of rural homesteads. They do have a primary school and a food shop, but no other establishments that I saw, and almost no cars. Instead, we saw small donkey carts on the dirt roads, many of them driven by children. Our new friend Thuseni Sigwadi (tshulu@gmail.com), who manages the Tshulu Trust and lives in Hamakuya, met us at the turn-off into the village. Thuseni had arranged for us to do an overnight homestay with the family of Rosina Tshinavhe, a widow with several children. Rosina's family compound. Standing are our translator Fhatuwani and Rosina's daughter Violet. 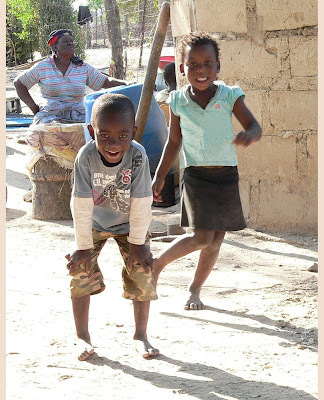 Rosina has three grown sons who work in Pietersburg, Jo'burg, and the nearby coal mine. Two grown daughters, Sarah and Violet, live with her, as well as a teenage son, Salani. 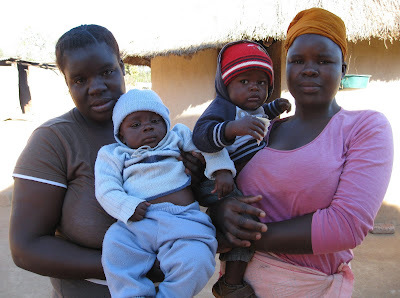 Sarah and Violet each have a baby, and Rosina has some primary-school children, but there were so many village children on hand to welcome us, I couldn't tell which ones were Rosina's. Almost no one except the teenage son Sarani spoke English, or if they did, they kept it to themselves. 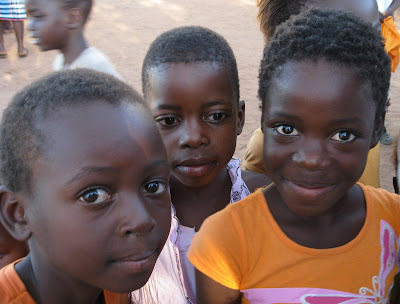 We did learn a tiny bit of Venda, but not enough to ask about family connections. 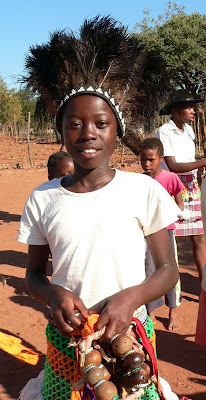 Thuseni had arranged for Makuya Fhatuwani to serve as our translator during our homestay. 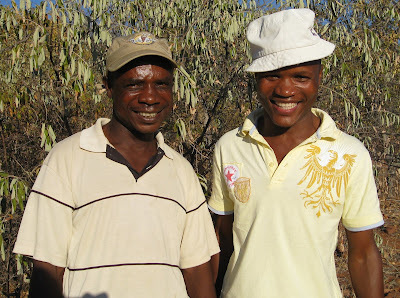 Fhatuwani works with Thuseni, as a nature and bird guide for the Tshulu Trust. Fhatuwani is also training for a job to track poachers for South Africa National Parks. He had a lot to say about that, which will be in a later post. 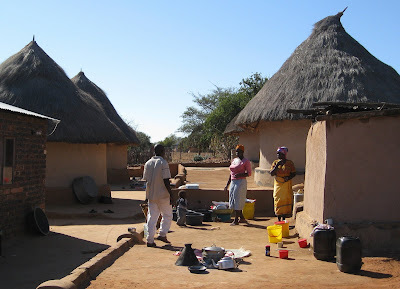 The Tshulu Trust not only arranges homestays as a way to bolster the income of Hamakuyu families who need it most, but also operates a small nonprofit resort (Tshulu Camp) on the Mutale River, on the outskirts of the village. 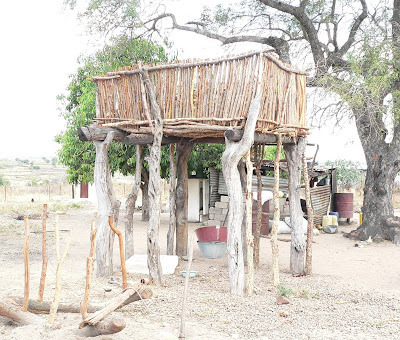 The Camp features baobab trees, ironwood groves, mopane woodland, and lots of bird species. It attracts birders, students, scientists, and tourists, and is often used for meetings or retreats, employing local people as caterers and housekeepers. More about the camp in a later post. Husband Ken, Fhatuwani, and Salani under a baobab tree in the village. Salani was able to reach a sweet fruit for us to sample. It so happened that the day we arrived in Hamakuya was a national holiday to honor Hector Pieterson, a martyr of the struggle against apartheid. Holidays mean traditional dancing, which was already underway when we arrived. I didn't realize at first that it was a holiday; I thought the dancing was all for us! I was a little relieved to find that was not the case. The dancing was different from Welverdiend's dancing - probably because the main dance troupe was young girls, maybe 8 to 14 years old. 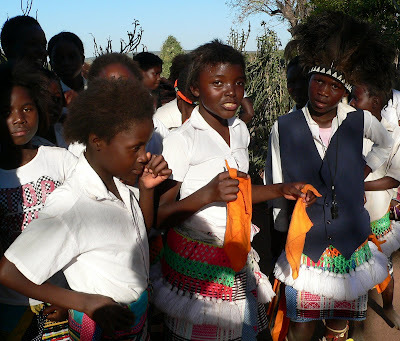 They had an incredible amount of energy and danced to drumbeats for a long time, wearing colorful skirts, waving orange scarves in unison, with rattles tied to their lower legs. I was entranced by the dancing. The leading girl wore a headdress of black bird feathers and blew the dance rhythms on a plastic police whistle. I happened to have a shiny new metal police whistle, which I gave her. She collapsed at my feet when I did (which alarmed me), until I learned that collapse is the Venda way of saying "thank you". The homestay was everything we hoped it might be. The buildings of Rosina's home were lovely. 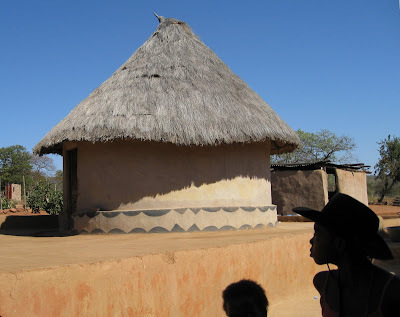 The family lives in several small clustered buildings; most are the single-room round earthen rondavels with thatched roofs that you see all over South Africa. Another shot of Rosina's family compound. Standing are our translator Fhatuwani, Rosina's daughter Sarah, and Rosina. The cooking pit with kettles and pots is in the center foreground. The rondavel where Ken and I slept had a handsome black pattern painted around the base (below). 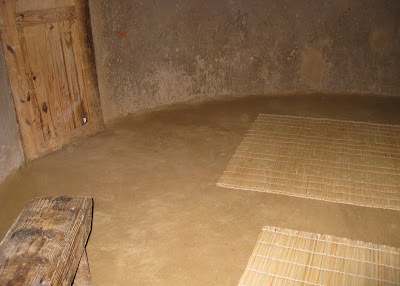 We slept on homemade mats on the rondavel floor (below), although foam mats are available for homestay guests. Floors were of dried and compacted cow dung and mud, pleasant to the feet and odor-free. Between the buildings was an immaculate and perfectly smooth courtyard also of mud and cow dung. Below, one of Rosina's children and Rosina in the courtyard. The cooking area (below) was a small shallow hole in the courtyard, with a tripod over a small fire. 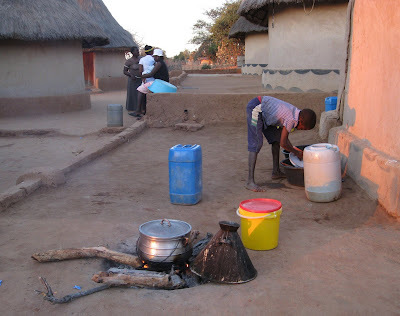 Above, daughter Violet stirs the pap (made of corn meal or maize meal and water) constantly to prevent lumps. Rosina is wearing yellow, behind the pot. Below, family and friends gather around the cookfire for conversation and food. Rosina's grown daughter Violet is in the brown shirt. Below, one of Rosina's youngsters washes the family dishes. The cooking pit and its pots are in the foreground. 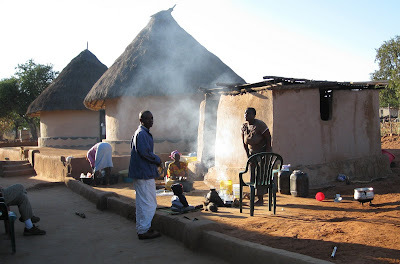 As homestay guests, Ken and I were brought our meals inside our rondavel. 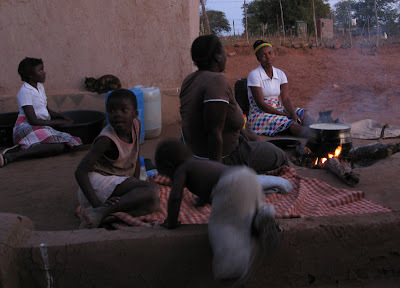 Fhatuwani and Salani often ate with us. First, Salani poured a gourd of water over our hands to clean them (Ken and Salani, below). We ate wild greens similar to spinach, white pap (like congealed grits), and mopane worms (caterpillars) in sauce. See below. 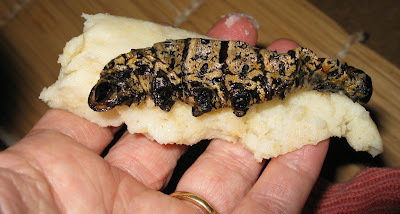 Below, a mopane worm ready for munching, on a wad of pap in my hand. The worms were surprisingly edible, maybe even tasty. The guts had been squeezed out and they had been dried for storage, then rehydrated with the sauce. 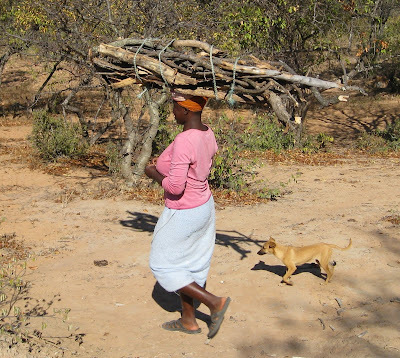 The family's daily tasks include gathering wood for cooking - which was no big deal in Hamakuya. They have not yet run out of wood as some communities have. 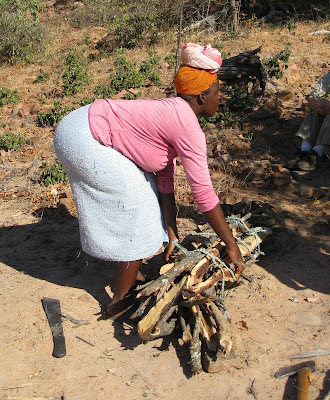 Ken and I went with Sarah to collect wood, and we didn't have to walk far to find the red bush willow they prefer for the cookfire (its smoke smells sweet). 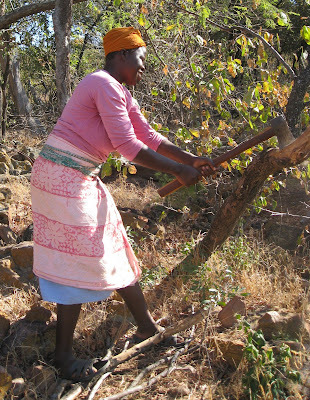 With a machete and an axe, she removed enough dead branches from the trees to make a substantial bundle in just a few minutes. Cutting only the dead branches maintains a healthy stock of trees, without depleting the number of living trees and branches. Above, Sarah chopped and bundled the wood. She then coiled a towel on top of her head, and carried the bundle home in ten minutes on the top of her head - no hands!! 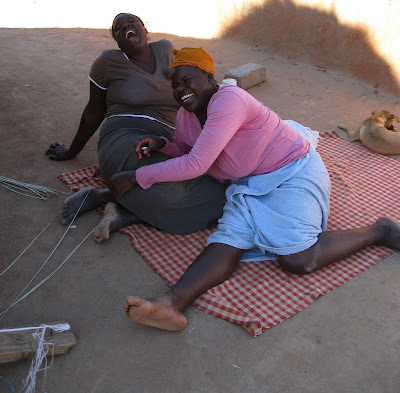 She even doubled over laughing at Salani's jokes on the way back, and still didn't use her hands to steady the bundle! 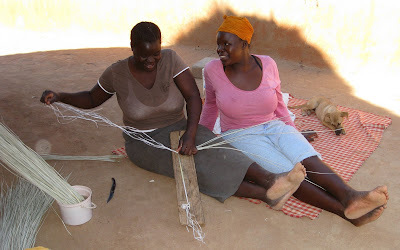 We learned that Rosina, the head of the household, generates income by making and selling brooms and sleeping mats, as well as by hosting homestays. 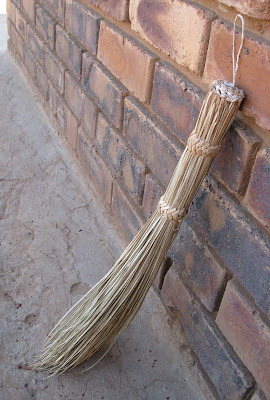 Rosina's daughters Violet and Sarah made brooms too. 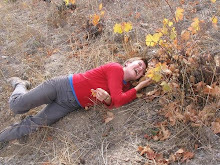 We all collapsed in laughter over one of my social gaffes. Below: Rosina's mats, woven on a handmade loom, were amazing. 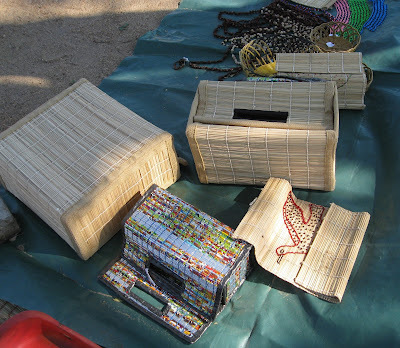 She used aluminum cans of sand as weights during the weaving process. 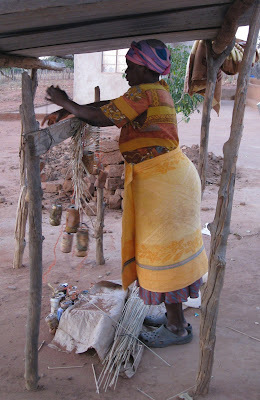 Rosina at work on her handmade loom, weaving mats to sell. A mat under construction on the loom. The foil is snack wrappers, woven into the stiff reeds for decoration. In addition to the brooms and mats, Rosina's family also owns a few cattle and chickens, which they can sell if times are tough. Rosina's sons presumably send her a portion of their income, and I'm guessing the family receives some money from the government for the young children. It's a meager existence by Western standards. But no less joyful than my own, and in some ways probably more so. The family spends almost all their time outside, almost all their time together, almost always moving around. They cook and eat every meal together, outdoors. That alone might be enough to make me a happy camper. The living quarters, what I saw of it, was impeccably neat and clean. The only bathroom was a "long-drop" (an outhouse) across a rocky field from the house, but that didn't seem to bother anyone. The only running water was a single spigot shared with other families, 100 meters up the road. That didn't seem to bother anyone either. They had no electricity. I don't remember if they had kerosene lamps, I don't think so. We had flashlights, so wouldn't have used them anyway. We slept on a grass mat on the cow-dung floor, like everyone else, which was not a problem. 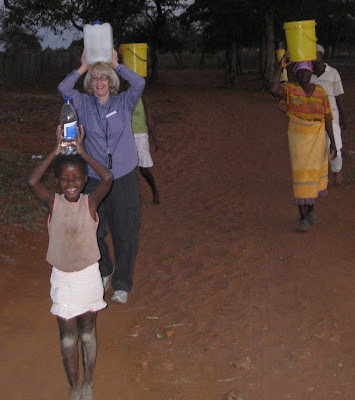 I went with Rosina and others to fetch water - she carried several gallons on top of her head (no hands). I couldn't manage more than a couple of quarts without pain. Even the kids could carry more water than I could. Me at left, Rosina at right. I've mentioned the good things about their lifestyle, yet I could see that Rosina felt the burden of her responsibility as head of household. Among the daughters and younger children, laughter was plentiful, even though the grown daughters spend much of the day cooking pap, gathering wood, tending the livestock, gathering wild plants to eat, making brooms, taking care of babies. Yet, as a mother myself, I'm sure Rosina worries about health care, secondary schooling for her children, drought, diminishing resources, low wages, difficulty in finding work for all of them. I never saw her at rest; she was always cooking, cleaning, weaving, tending children....working. Neither Rosina nor the daughters were much inclined to talk to us, even through the interpreter Fhatuwani. Most of what we learned was from Fhatuwani directly or from Rosina's teenage son Sarani, who attends an internet technology school and is well-acquainted with Western culture. I'm not sure why, but in Welverdiend too we found that the men were much more interested in talking to us than women were (in general, there were exceptions). I would like to understand that better. Do the men go to school longer? Know English better? Do they feel more comfortable discussing the sustainability issues that interested us? Do cultural expectations keep women quiet? I want to go back, right now. To Hamukuya and to Welverdiend. If you're interested in visiting Hamakuya or a stay at Tshulu Camp, as a family or a school group or tour group, you can contact me at sally.kneidel@gmail.com or contact Thuseni Sigwadi at tshulu@gmail.com. Thuseni's phone is 072 977 6669 within South Africa; from the U.S. it's 011 27 72 977 6669. If you do go there, you're supporting a proactive community that very much needs and deserves support. 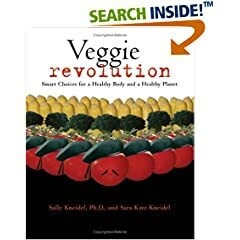 Drought and a rapidly changing world have impacted their lifestyle dramatically. They need a bigger share of the world's resources, and as Westerners, we can give our travel dollars to them directly, rather than to international hotel chains.